Casement windows are a great choice when you need to replace a window that’s located in a tight space or over a counter, requiring a reach to operate. If you live in the Louisville, Kentucky, area and are looking for a replacement window company that offers both outstanding products and services, look to Compozit Home Systems. We’ve been installing top-of-the-line replacement windows since 1982, and our commitment to customer service has helped us maintain an A+ rating with the Better Business Bureau for many years. We also offer some of the highest performing windows on the market and back them with outstanding warranties, giving our customers peace of mind about their investment. Our Compozit series windows, constructed of state-of-the-art expanded polymer composites to provide superior durability and structural integrity. Our more economical C2 SERIES windows, constructed of Compozit-clad vinyl and still offering outstanding performance. Both types of casement windows we offer feature low-E coatings, argon gas fills, and other insulating features and are ENERGY STAR® certified, meaning they can help you save on your monthly energy costs. They also exceed industry standards for impact resistance, weatherability, and heat resistance. 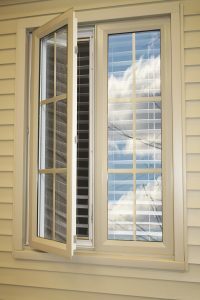 To learn more about the casement windows we offer to Louisville-area homeowners, contact Compozit Home Systems today. We offer financing plans featuring low monthly payments to homeowners who qualify.